Recycle your cereal box (bags) inserts. They come in very handy. Use them as freezer bags, storage bags, mini trash bags, or any other purpose that you would use a freezer or storage bag for. They are heavy duty, easy to see through, and best of all, they are FREE! Try it, you will like it! Cereal bag liners keep lettuce, celery and carrots fresher longer. Yep, I use cereal bags in the freezer and they are nice. They are a nice thickness to keep things fresh! Amen, wish I had sent this in. I love these bags, they do all everyone has mentioned and more and already paid for! Love this idea! I use them after I make chex mix homemade (or the generic/store brand of chex mix). Its much better homemade. Use the leftover cereal bags to store the finished mix, keeps it very fresh! I use cereal box liners to make hamburger patties. It cuts down on the mess and, unlike wax paper or plastic wrap, it rarely tears. I've even taken the bags & cut them into squares to place between patties to freeze them. is perfectly protected and preserved in the freezer. If you're using them to store anything outside the freezer, just a clothespin keeps them closed securely. This may not be a new idea, but it's nice to see that it's catching on in so many kitchens around the country. They are by far the strongest wrap I've found anywhere at any price. Too bad, we can't buy it in a roll, or maybe we can, and I just don't know about it. Thanks for the posting to remind us. I crochet snowflakes and stiffen them and I found cereal liners to be the best material to use to pin and stiffen the snowflakes. and they are free! 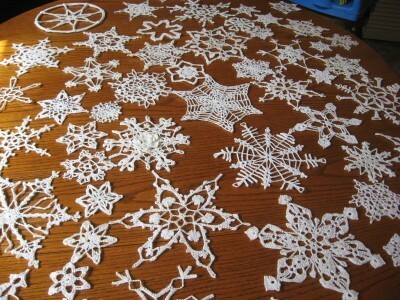 Kerredur, your snowflakes are gorgeous! I wish I could crochet like that. I am so happy to read on how cereal box liners can be used in so many different helpful ways! I love to use them in collecting my "wet, messy small" garbage. I collect any potato skins, chicken skins/bones, other meat, onions, egg shells, coffee grounds, old left over rice, etc. Use these bags when traveling to keep fresh wet cloths on hand. Keep soiled items from contamination by using a different bag. I use these bags for storage that I want to keep clean. You can use a vacuum sealer to seal the bag up. It keeps documents dry and water proof in case of flooding. Protect jewelry, stamps, pictures, or any collectibles. I like to poke holes in the sides of the bag to add my rice. Seal bag shut. Drop into boiling water. Boil in bag that cooks rice perfectly. Save your wax bags that your breakfast cereal comes in, they make great storage bags in the kitchen. Even better, split one side and lie flat. You now have a nice waxed paper surface to lay your food on or to work with. To save money buying freezer bags, I use the cereal bags inside the box. They are really good and can be washed and reused again. Save your cereal bags, they have lots of uses. I save the wax paper cereal bags that come in almost all boxed cereals for later use in the kitchen. I empty the crumbs out and save them in an empty cereal box. The bags can be used in place of plastic wrap for re-heating food in the microwave, storing homemade bake goods, storing a toddler's leftovers in the refrigerator, etc. I also use the bags for cooking my corn on the cob in the microwave. My family loves how the corn turns out and it's quick, easy and no clean up is required. You probably would normally just throw these bags out but now you can use them first and then throw them out.